Offer incentives based on individual performance. People embrace working towards rewards, whether they are financial (as a bonus), material (think company watch), intangible (time off afterward to acknowledge a tough timeline) or the chance to advance in the future. Provide constructive feedback that acknowledges a job well-done — not just for new employees, but also the long-timers that we already expect are doing a good job. If you are dissatisfied with how they handled a process, outline clearly your expectations for improvement. Arrange support if employees are feeling overwhelmed. When necessary, call in other team members to help, or seek temporary outside help. Such an approach not only indicates that you are empathetic to a specific problem, but also promotes the concept that each employee has responsibility for other team members. Always have an open-door policy that is highly geared toward engaging the employee’s feedback — whether or not the comments are positive. Moving forward depends on understanding how individual employees see the process and letting them provide input into how they believe things in the company should work. Let’s face it … even managers get complacent with the way things are and can start losing sight of new ideas. Embrace team spirit. Encourage comradery among all employees, where it promotes a work process that builds on everyone’s ideas and contributions. Constantly reinforce the goals of the company and how each employee is an integral part of making it happen. Reducing complacency in the workplace is essential to maintain staff motivation and productivity, and to create a positive environment that provides all employees the opportunity to contribute — not only to the organization, but to their individual self-worth. If you want to reduce staff time off and turnover and provide a solid footing for an organization to move forward, use these insights to foster a team environment that encourages employees to meet the challenges at work, while receiving constructive feedback and appropriate rewards along the way. Owner-managers have adapted quickly to transferring funds electronically, paying invoices online and scanning and sending data to and fro. When it comes to product delivery, contracts or agreements, many are still relying on hardcopy signatures or faxed copies of paperwork to finalize the deal or witness product or service transactions. This process can be time-consuming, with the need to attend your solicitor’s or client’s site, or to print and file shipping or receiving documents. Signing documents electronically is a great solution for saving time while ensuring they are legally binding. Two types of signatures are available that help make this process easier: a digital signature and an electronic signature. 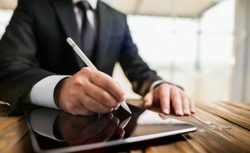 Electronic signatures, as the name implies, require the signatory to sign the document which, in effect, has the same legal standing as a handwritten signature. Digital signatures, on the other hand, utilize user-friendly, secure cryptographic protection on your signature and offer end-to-end privacy. Both methods produce the same effect: The signed document is recognized as an authentic signature of a signatory and meets the Canadian standards for electronic signatures. Hardware cost for signature pads varies from $150 to $650. The less expensive models provide a basic touchpad and stylus, while the more expensive approach legal-sized electronic units that will provide an electronic copy of the document and a hardcopy if needed. Regardless of the unit you’re considering, ensure your choice includes high-quality biometric and forensic capture techniques to guarantee confidentiality and reliability. You should be able to provide your signature via all of the business’s formats (smartphone, laptop, etc.). Using your finger, stylus, mouse or keyboard makes it valid. It should enable a complete audit trail with date and time stamps and in-document checkboxes that ensure signees follow the expected procedure in a reasonable timeframe. Your documents should be secure, encrypted and legally binding in every country. Signatures should be able to be stored securely in the Cloud and at your premises. User authentication methods should be equal to the transaction’s security need. There should be multi-party signing capability for items needing more than one signature. You should be able to track the progress of the document. The solution should be able to integrate with the application your company is already using, such as Google Drive, DropBox or SalesForce. The cost of obtaining and maintaining your electronic signature template is tricky to find and understand. Most websites will not provide a specific quote. Some will start with a basic per-year cost, but will still require that you contact them to see if your business is able to take advantage of bulk discounts or discuss whether your specific application requires additional features that add to the cost. Companies such as Adobe may offer their service as part of an integrated package. Packages are usually sold for a flat monthly or an annual fee, or are based on the number of senders (similar to costing structures of most software, where more users means higher cost). Or you may pay on a per-signature basis. As you can see, good business practice suggests that determining what the business requirements are before making a final decision will avoid disappointment and expensive upgrading. You will need to contact the supplier for help determining your specific needs, then work with them to agree on the costs to the organization for such a solution, based on how you will integrate existing systems and your needs for hardware, software, communication and reporting. If your business has become comfortable with the paperless approach and you’re already using it for banking, invoicing, payroll, purchasing and sales, maybe it’s time to “complete the circle” and adopt electronic signatures, too. TFSA and Death: Have You Planned for What Will Happen With Yours if You Die? If you own a TFSA, you undoubtedly started it because it allows you to invest and earn dividend or interest income and make a capital gain without paying tax. Unfortunately, similar to any investment vehicle, complications may arise after your death unless you address the tax consequences in advance. Consider the following circumstances that can affect what happens with your TFSA after you die. If you have named a survivor — your spouse or common-law partner — as a successor holder, then that individual acquires all the rights of the original holder and thus becomes the new account holder. With this scenario, the TFSA does not terminate and thus there are no tax consequences to the new account holder. An additional benefit may accrue if the original holder has overcontributed before they passed and the new account holder has contribution room in their TFSA. In this situation, the overcontribution by the deceased can be absorbed by the new account holder into their TFSA, thereby eliminating the chance of future overcontribution penalties (currently at 1% per month). Assume for a moment that the deceased did not designate the spouse or the common-law partner as a successor holder. What then? If the spouse or common-law partner named in a will are accorded an inheritance that includes the TFSA, they can transfer their spouse’s TFSA to their own TFSA within a prescribed time period, called the “rollover period.” The rollover timeframe is explained as starting at the time of death until December 31 of the following year. During this rollover period the investment income is sheltered from income tax. If the beneficiary decides to transfer funds to their own TFSA during the rollover period, these transfers are considered to be “exempt contributions” and as such do not require that the beneficiary have room in their own TFSA. However, the amount of the transfer is limited to the fair market value (FMV) of the TFSA as at the original holder’s time of death. Thus, if at the time of death, the FMV was $50,000 but at the time of transfer the value of the TFSA was $55,000, then the $50,000 could be transferred without any impact. However, the $5,000 increase would either have to be absorbed by the beneficiary if they have room within their TFSA, or be included within the beneficiary’s income within the year of the transfer. When you die without a spouse or common-law partner, the TFSA is collapsed at the date of your death. The amount of the TFSA can be transferred to the named beneficiary tax-free, but only up to the amount of the FMV of the TFSA at the date of death. Naturally, the beneficiary would need to have TFSA room to absorb the FMV transfer. For instance, if the beneficiary had $30,000 of accumulated TFSA room and the FMV of the transfer was $55,000, $30,000 would be transferred tax-free while the excess $25,000 would be included in income in the year of transfer. It is worth noting that when a contribution is made to the successor holder’s TFSA, the successor holder has 30 days from the date of contribution to fill in Form RC 240, Designation of an Exempt Contribution Tax-free Savings Account (TFSA). As you can see, there are potential tax complications with a TFSA when a taxpayer passes. Remember also that the provinces and territories are responsible for the rules governing the transfer of assets of a deceased. Fortunately, the CRA and their provincial/territorial counterparts have agreed that having the named beneficiary on the TFSA application will allow transfers without interjurisdictional complications. Quebec may be an exception, wherein the TFSA transfer goes to the estate and the will of the deceased comes into play. Since TFSAs are registered with the CRA, an astute taxpayer would want to determine the tax consequences, either when their TFSA has a named survivor or when the will takes precedent. It’s probably worthwhile to confirm that your CPA is aware that you have a TFSA. Then, should you die unexpectedly, your tax advisor can assist your successor holders or beneficiaries. But what are the possible consequences should management be unable to fulfill all of these responsibilities? Not monitoring sales or collecting accounts receivable may mean going to small claims court to seek payment for receivables up to $25,000 (in Ontario). 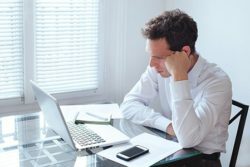 The cost of gathering data and time presenting yourself in court or hiring a paralegal may cost more than the amount that you’ll ultimately be writing off. Decide that you don’t want to pay an outstanding invoice with a supplier and you may be denied further service or product, which could bring your business to a standstill. At the very least, expect annoying collection calls — at the extreme end, you could face legal action that will swallow up your time and money while you defend yourself. Continuously bounce cheques, and suppliers may demand cash-on-delivery or reduce your credit status, thus also hampering your ability to produce product or deliver service. If you do not control your bank balance and are routinely going into overdraft, you may have to manage with a poor credit rating, interest and overdraft charges, and holds put on your deposits. Borrowing for any business asset puts the business and owner-manager at risk if the loan’s terms and conditions are not met. Caveats in lending contracts that are broken may result in the loan being called, creating a cash crisis in the business. Failure to repay a loan on a secured asset will result in the asset being seized — try running an operation without one of your key pieces of equipment. If you have signed a personal guarantee on a business loan, your personal assets may be subject to seizure as well. Your business will be subjected to fines and penalties from WSIB (Workplace Safety and Insurance Board). Insurance and borrowing rates will increase in light of an accident. In severe situations, your worksite may be shut down for failure to comply with safety rules. If there is catastrophic injury or death, your business and you may be held personally liable as an officer or director of the company. “If you do not fulfill your obligations or comply with our payroll requirements, you may be assessed a penalty, interest, or incur other consequences. Not filing GST or HST (Goods and Services Tax or Harmonized Sales Tax) will not only mean penalties and interest levied to your business, it will no doubt result in a visit from the CRA to review your business operations to determine if there are deficiencies within your accounting system contributing to your failure to file. Since you are really collecting GST/HST funds from your clients on behalf of the government, the CRA takes strong exception to the fact that they have not received those funds. Not filing corporate income tax can mean fines and penalties if corporate taxes are owing, and potentially worse consequences. Although rare, jail time can result if a demand for filing is made and the business does not comply. If taxes have not been filed for several years, the CRA may arbitrarily file a tax return and send the business a Notice of Assessment that says funds are owing. This usually encourages corporations to file their returns on their terms. When tax returns have been filed, but income tax owing has not been paid, the CRA will freeze your corporate bank account. This effectively limits your ability to use that account to operate your business. Payroll, automatic deposits, automatic payments — in effect, all bank transactions — will come to an abrupt halt. Organizations that are required to collect personal information as part of their normal operating procedures must also, “protect information against loss or theft as well as safeguarding the information from unauthorized access, disclosure, copying, use or modification.” These requirements apply regardless of the format in which the information is stored. Once this information is obtained, many private-sector businesses within Canada are required follow the guidelines laid out in the Personal Information Protection and Electronic Documents Act (PIPEDA — note that a different provincial privacy legislation may apply in Alberta, British Columbia and Quebec). One section of this Act gives people a right to access their personal information held by your company. Employers are required to provide this information on request, so it is incumbent upon them to be able to access and provide it. There are some exceptions, so check with your legal counsel if you are not sure. Becoming involved in unresolved labour disputes is an employer’s worst nightmare, and it results in provincial Ministry of Labour or its equivalent getting involved in the dispute process. Management must be aware of employment standards, as well as those that apply to workplace health and safety. Employers make a serious error if they fail to treat unionized employees fairly, or do not submit deductions for union dues and other employee deductions required under a collective bargaining agreement. Not only will such an approach give rise to legal action for collection; it could also mean a union refusing to provide employees for projects that require unionized workers. The bottom line? Your business income suffers. A successful owner-manager understands that, while they have the appearance of being in charge and in quasi-control of their company, that control is only valid if their operation complies with the multiplicity of third-party plans that have been adopted, external orders they’ve have been given and third-party principles laid down in laws or regulations. How can an owner manager rectify and prevent the continuous invasiveness of third parties and thereby maintain control over their operations? It is only by fostering a culture of process and procedures within an organization that follow external rules and regulations.